Short Sell or Stay? Free No Obligation Anaylsis! There are times when tough questions deserve an honest answer. A question homeowners like yourself are asking every day is, “Do I short sale my home or stay and tough it out?” Either way, to make the best decision, you should have all of the information in front of you. Being able to see the current market value of your home and projecting when your investment will break-even and become an asset again is invaluable to your decision making process. With our Short or Stay Calculator you’ll be able to do so in a matter of minutes. Step 1: Your Property Information – enter your property’s address information. Step 2: Your Mortgage – provide some basic mortgage information such as your balance and interest rate. NOTE: Your information is closely guarded and never sold. 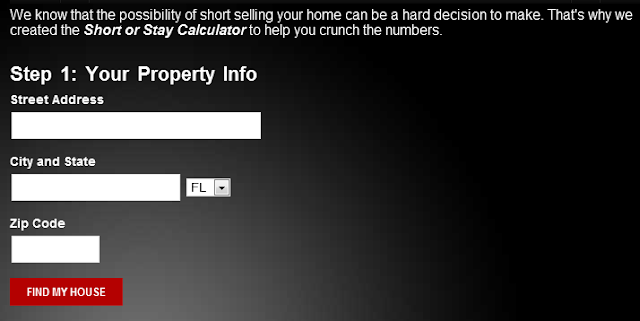 Step 3: Your Information – supply your email address to receive an email that has your Short or Stay Calculator results. That’s it. It’s that simple! The Sellin’ With CC Team are licensed REALTOR®’s with Keller Williams Jacksonville Realty and are knowledged in all areas of the Jacksonville, Orange Park and St. Johns’ market. We specialize in helping with military relocations, short sales, foreclosures, first time homebuyers as well as those looking to purchase a new home or investment property.